What happened 16 years ago in Chance Harbor? It's the question that's been hanging over The Secret Circle since Cassie's mother died in a fire on the pilot and we learned that's the same way many other parents of coven members were also killed over a decade ago. 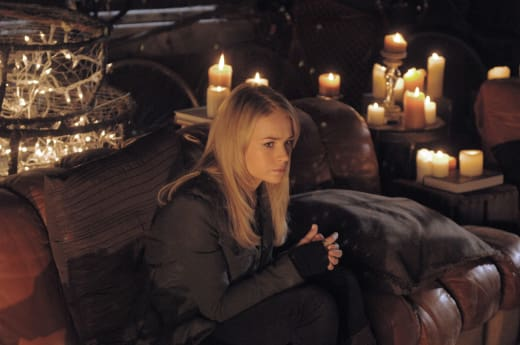 Tune in this Thursday for answers, star Britt Robertson just told me over the phone, as "Witness" is "different from any other episode you've seen so far." "We talk about 16 years ago so often and now we get to relive exactly what happened," the actress said. "I go on this journey with Jake. I see through his memory what he saw the day of the accident." Ah, yes, Jake. He interrupted Cassie and Adam during a rather intimate moment last week. How will the latter react to Jake's presence this Thursday, especially when Robertson says Cassie and Jake will "take this journey together, hand in hand, without the rest of the circle?" "Jake will stir up a lot of turmoil for Adam, but also for all the characters," Robertson says. And what is it that attracts Cassie to him? The guy may have saved her life once, but he's also been acting as a witch hunter for years. "I think it's the battle of good versus evil," Britt explained. "Adam represents the good in Cassie. He wants to see her continue to be the person she's been... but Jake represents this new, darker side. There's also more o a mystery to him and he seems to have some answers. I think it's more about using Jake in a way, to find out about her past." And, finally, about that past: Is there anything at all Robertson can tease about the reported return of - gulp! - her father? "He could show up in a flashback. He could appear in present day. You'll have to tune in and see," she said. No worries there, of course. We most definitely will. 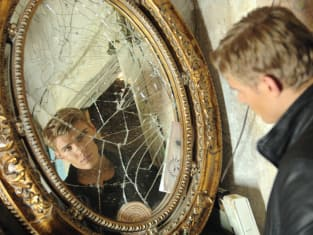 The Secret Circle Round Table: "Witness"